At Earth Smart Remodeling, Inc. we install replacement windows in a wide range of styles and quality materials to match your home's style and fit your budget. We work with leading window manufacturers to be able to offer the best products and warranties. No matter what your reason for replacing your house windows, Earth Smart Remodeling, Inc. is the window installer you need to help you choose the perfect replacement windows to solve all your needs. Call us or click below to schedule a free window replacement cost estimate in Haverford, Cheltenham, Glenside, or nearby Pennsylvania. We installed a new bay window by replacing an old bow window for this home in Jenkintown. Pa. When installing a bay or bow window it is important to have a cable support system installed to prevent the window from sagging. As seen in these pictures there are cables running through the window frames, and then anchored into the brick. Once anchored the turn buckle pulls the window to level. This process assures the window will stay level, and the windows will open and close with no chance of air infiltration. Once completed a new roof pent is installed to protect the top of the window from the elements. These five windows had seen much better days. Our team installed five brand new triple pane double hung windows that will keep this home protected for years to come all while boosting the home's curb appeal. We removed these old wood double hung windows and replaced them with beautiful new maintenance free double hung windows. These new windows are beautiful and energy efficient thanks to low-e and argon gas. This homeowner called us out because their windows were leaking air. For their replacement windows they decided on Earth Smart Remodeling, Inc.'s Sunrise Window. The Sunrise window has one of the lowest air infiltration rates in the industry. The windows were installed in 1 day into a brick opening. We finished with silicon caulking and exterior aluminium capping. Now our clients can live comfortably and draft free! "The time from my order to installation was much longer then..."
Your windows aren’t just for letting air and light in; save time and money while making a positive impact on the environment by switching to energy efficient Sunrise Windows. Beyond the energy savings you can gain with replacement windows, the number of design options we offer gives you the chance to completely revolutionize the look and feel of your home. For instance, you can choose double-hung windows in royal brown with exterior brickmould for added detail. And you can opt to maximize your savings by using one of our high performance low-e glass options. We take a great deal of pride in the quality of our products and workmanship. Our company has built a reputation for expertly crafting our top-of-the line products, and once you’ve seen the Sunrise difference you’ll never look at your windows in the same way again. We have a large variety of window styles that can fit any home and our dealer network can use their years of experience in the field to help you with the design process. Choosing the frame material is a very important part of any window replacement. Not only does the frame play a role in the window's appearance, but each frame type also offers other benefits. Whether you want to replace your existing windows with the same frame material or you're interested in a different material, we offer a wide selection of options and materials to make it easy to match your home's design and your other windows and doors. Interior wood frames combined with exterior aluminum provides timeless beauty, durability, and excellent insulative value. While they might require more maintenance than other types of windows, wood is always a popular option due to its unique beauty. 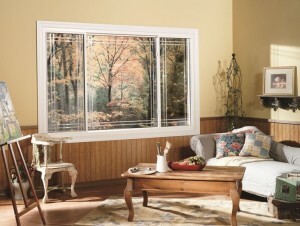 Read more about our beautiful, energy-efficient wood windows. Fiberglass windows are extremely energy efficient and can provide the look of painted wood with a high-performance, no maintenance design. If you want the beauty of wood or some other window material without some of the drawbacks, then fiberglass windows are perfect for you. Browse our fiberglass window installation services. Earth Smart Remodeling, Inc. is a trusted window contractor in Haverford, Cheltenham, Glenside, Abington, Drexel Hill, Cherry Hill, Horsham, King of Prussia, Feasterville Trevose, Huntingdon Valley, and many surrounding areas in Pennsylvania.